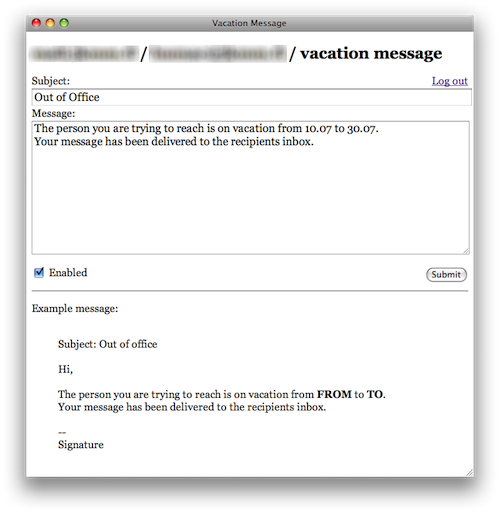 A while back I got really frustrated with the belly dance one has to go through to get vacation messages going on OS X server. And even after that you have to leave your users with Squirrelmail as the UI which get’s impossibly slow if they have a lot of messages in their inbox. So the idea was to write a full-blown Sieve script GUI, which would also allow for easy OOF message creation. Kinda like Smartsieve but with a more modern GUI and better authentication support (based on libsieve for PHP). I’ve decided to put it out there in case anyone else (running Roundcube and not planning on upgrading to 10.6 any time soon) is looking for something similar. You can download it from here. The system is built on Codeigniter which with it’s current specs is total overkill but might prove useful if it’s ever developed further.